Give them great meals of iron and steel and they will eat like wolves"
Stainless steel is, by and large, an industrial component. It's therefore easy to forget that the metal, aside from being extremely strong and durable, is extra­or­di­narily malleable, relatively light and capable of taking exceptionally delicate forms. All of these qualities come seamlessly and beautifully together in the work of award-winning artist Candice Bees. Candice hails from the Newport area of Wales, where contact with the natural world is an everyday experience; this close and constant contact is the basis of Candice's artistic inspiration. 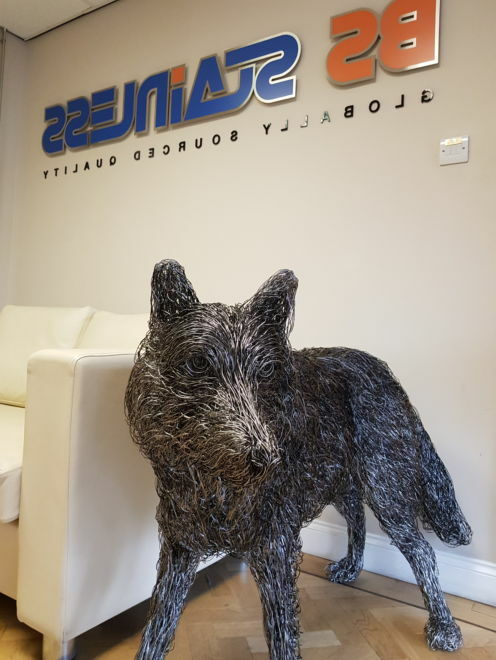 She first got in touch with BS Stainless some time ago when she had the idea of creating a naturalistic replica of a hare using stainless steel wire. We happily supplied her with the material and were truly amazed when she shared photos of her finished creation; she had perfectly captured the swiftness, strength and grace associated with the animal. After creating the steel wire hare, Candice continued to develop her talents, winning the David Shepherd Wildlife Artist of the Year (urban wildlife category) in the process. Inspired by the success, Candice began creating other life-sized sculptures. On winning the coveted award, she said: "Hopefully this will help to put me on the map a bit and mean that I require much more wire in the future", which turned out to be prophetic words. BS Stainless commissioned Candice to create a piece of work to grace our stand at the upcoming Wire exhibition in Dusseldorf. The Wire conference is an important date in the stainless steel calendar and, as the UK's largest independent supplier of stainless steel wire, repre­sen­ta­tives from BS Stainless will maintain an authoritative presence during proceedings. Candice's sculpture is breat­hta­kingly beautiful and will create a strong visual aesthetic perfectly suited to the BS Stainless ethic. Wolves are social, friendly creatures with a high level of intelligence; these qualities ensure the continued survival and success of the pack via the sharing of crucial information. At the risk of blowing our own trumpet, our team also comprises social, friendly and intelligent creatures who work closely with customers and suppliers to ensure the most efficient exchange of information! Make sure you are subscribed to our newsletter for details of our visit to Wire in Dusseldorf, which takes place in April of this year. BS Stainless: your partner for stainless steel.